Carrying on the brand’s reputation for minivan firsts, the 2013 Dodge Grand Caravan has become the first—and only—vehicle on the marketplace to offer a rear-seat entertainment system compatible with both Blu-Ray discs and traditional DVDs. There also is a new model on the menu, as part of a reconfigured lineup for the 2013 Dodge Grand Caravan, and it showcases the lowest MSRP in the minivan segment. Three new exterior colors are now offered as well: Billet Silver, Maximum Steel and Blue Streak. Yes, the 2013 Dodge Grand Caravan AVP puts the emphasis on value, but that base model does have air conditioning, the brand’s Stow ‘n Go seating system, power windows/locks/mirrors, keyless entry, and an MP3-compatible sound system with steering-wheel audio controls. Upping the comfort level is the 2013 Dodge Grand Caravan SE, which includes an enhanced Super Stow ‘n Go second row, three-zone climate control, body-color exterior accents, a floor console with cupholders, 17-inch aluminum wheels. Keyless entry, halogen quad-style headlamps, and additional audio speakers. Moving up to the more premium players on the roster, the 2013 Dodge Grand Caravan SXT is the least-expensive minivan in the country with powered, dual-sliding doors and a power liftgate. And that’s in addition to powered second-row windows and third-row window vents, Dodge’s Super Center Console, and easy-to-stow roof racks. The Crew model then introduces lux cues ranging from bright chrome exterior accents to a leather-wrapped steering wheel and shifter, ambient lighting, a power-adjustable eight-way driver’s seat, a power liftgate, remote start, fog lights and a 6.5-inch touchscreen media center with 12-month complimentary subscription to SiriusXM satellite radio. The 2013 Dodge Grand Caravan R/T takes things in a sportier direction, with a monochromatic exterior color scheme, 17-inch satin-carbon aluminum wheels, a luxurious black leather interior set off by red accent stitching, and an upgraded audio system with nine speakers, a subwoofer and amplifier. The R/T also benefits from a retuned suspension for driving dynamics that push the minivan envelope. A wide range of additional technologies—detailed in the Technology section—also are available for the 2013 Dodge Grand Caravan portfolio. The proven, prize-winning Pentastar V6 is the sole powerplant in the 2013 Dodge Grand Caravan, with the 3.6-liter engine serving up 260 lb.-ft. of torque and best-in-class marks for horsepower (283 hp) and towing (3,600 lbs.). A six-speed automatic transmission handles shifting duties in all models. 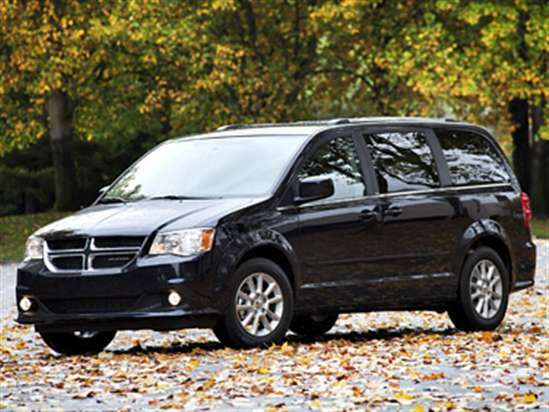 In EPA testing, the 2013 Dodge Grand Caravan has proven capable of reaching 17 mpg city/25 mpg highway/20 mpg combined. The Insurance Institute for Highway Safety (IIHS) has conferred Top Safety Pick status on the 2013 Dodge Grand Caravan, which also was a 4-star overall performer in the New Car Assessment Program evaluations, overseen by the National Highway Traffic Safety Administration (NHTSA). Individual NHTSA results included 4-star grades for frontal crash and rollover protection, as well as a 5-star mark for side crash protection. Top technologies offered in the 2013 Dodge Grand Caravan include those found in the Safety Sphere Package, which bundles a rear park-assist feature, a rearview camera, blind-spot monitoring, rear cross-path detection, rain-sensitive wipers and automatic headlights, and another new safety benefit for 2013—Trailer Sway Damping—is standard across the lineup. Naturally, a Uconnect infotainment/connectivity system is available as well, adding voice control and Bluetooth technology for audio streaming and hands-free calling. And the 2013 Dodge Grand Caravan’s new entertainment system goes beyond its Blu-Ray functionality to also welcome an HDMI (High-Definition Multimedia Interface) for video-game inputs, two USB ports, a 115-volt power outlet, dual nine-inch screens and wireless headphones.